Virgin Atlantic Flight VS610 from Barbados was quarantined on the morning of Wednesday, March 6th at London’s Gatwick airport. The flight parked at a remote area of the airport around 5:30 AM after dozens of passengers onboard reported feeling ill and nauseous during the flight. The Boeing 747-400 landed at Gatwick around 5:20 AM Wednesday morning with 448 passengers onboard. After operating a charter flight from Bridgetown, Barbados carrying MSC Preziosa cruise passengers. After landing at Gatwick the aircraft taxied to a remote hard stand to meet emergency response teams from the South East Coast Ambulance Service and local police. 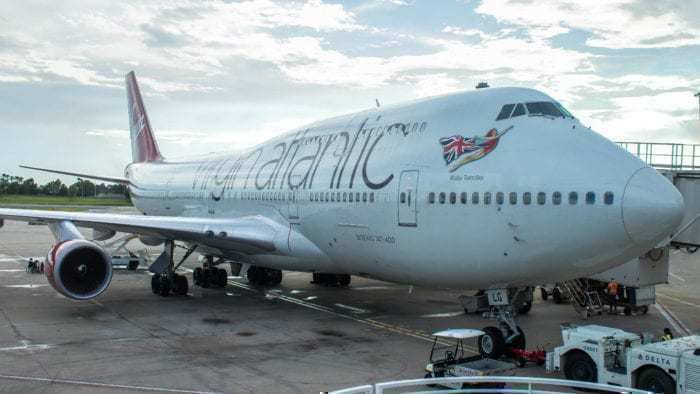 Medical personnel and authorities made the decision to screen everyone onboard, in line with standard health and safety procedures, according to Virgin Atlantic. The South East Coast Ambulance Service reported that they assessed and treated approximately 30 passengers and crew, most of whom were allowed to be discharged from the scene. Only two passengers were taken to hospital for further checks. A spokesperson from the Ambulance Service released a statement regarding the incident, stating they were called to attend a flight at Gatwick after several reports of passengers and crew feeling unwell and nauseous. Swiss-based Cruise line MSC Cruises, the operator of the cruise, said the company is investigating and seeking reports from doctors treating the passengers. The company said there have been no cases of similar stomach ailments on the cruise ship in the past two weeks. London Gatwick added that some passengers had left the airport and continued with their journeys by 9.20am. Featured Image by Trevor Wilson via Twitter. Do you think Virgin Atlantic handled the situation well?